Say "thank you" with a memorable gift. When you're on vacation, buying souvenirs can be a fun part of the experience. When you're purchasing things to bring back, don't forget your house-sitter. Even if you trade house-sitting with a neighbor and they insist on not being paid, it never hurts to bring back a small gift to let them know how much you appreciate them. Vase with Flowers - While flowers are always a nice gift, pairing them with a vase gives the recipient something that will last longer than the flowers. Look for a vase with some character that is locally made, or that somehow highlights the area you visited. These crystal vases are hand-etched in Montrose, Colorado by artist Lorraine Coyle. 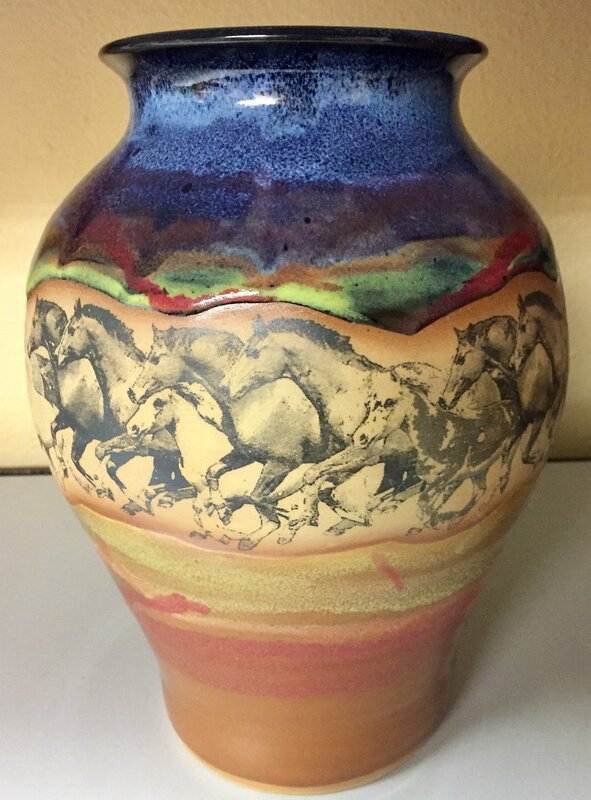 This handcrafted vase is made by Always Azul Pottery in Villa Grove, Colorado. Picture Frame - A picture frame can be a fun gift that your house-sitter can personalize by adding their own photo. If you got a great shot of some beautiful scenery on your trip, you could put it into the frame before presenting it to the recipient. When choosing a frame, keep in mind the taste of your house-sitter, and if in doubt, choose something on the neutral side. We carry several wooden frames made in Larkspur, Colorado. Christmas Ornament - Christmas ornaments are great gifts. Not only are they small and easy to pack, but they are also easy to customize to the person's tastes and preferences. Depending on what you think the recipient would appreciate, you can select an ornament that represents the place you visited, or just find a nice ornament that shows your appreciation. These ornaments are made from real Colorado aspen leaves! Each of these Originals by Monique ornaments are hand painted in Golden, Colorado. These are just a few ideas to get you started. Whatever kind of gift you choose, your house-sitter will be happy to know you thought about them while you were gone. A delicious gift that's made in Colorado? Yes, please! Looking for something special for your someone special on Valentine's Day this year? How about something made by a local Colorado company? At Frisco Fun & Formal, we've got an ever-expanding selection of made-in-Colorado products, and many of them happen to make perfect gifts for your Valentine! It's hard to go wrong with some all-natural, made in Colorado, wonderful-smelling soaps, lotions and body butters. We've got a variety of scented soaps from Breckenridge Soap Company, and a great selection of lotions by Bee Happy, from Erie, Colorado. All of these products are personally tested, approved and used regularly by our staff! Breckenridge Soap Co...so many amazing scents to choose from! Bee Happy lotions and body butter in amazing all-natural scents like Almond and Palisade Peach! If you're looking for a candle made right here in Summit County, Colorado, look no further. Made with sustainable palm wax, each candle is a work of art. These great-smelling candles make a perfect gift. Last but definitely not least, we have the always-popular gift choice of chocolate. What could be more appropriate than Chocolove? Made in Boulder, Colorado, Chocolove comes in a wide variety of flavors and we can personally attest that they are all delicious. The hardest part of working here in the shop is not eating all the inventory! We also have toffee from Fern Creek Confections out of Fort Collins, as well as chocolate bars and other fun candy like Bear Droppings and Mountain Seeds from Colorado Candy Kitchen in Glenwood Springs. If your valentine is not a fan of chocolate, we also have jam, jelly, honey and hot sauce from Colorado companies. There's something sweet for everyone! If you're looking for the perfect Valentine's gift in Frisco, Dillon, Silverthorne, Keystone or Breckenridge, come check out our selection at Frisco Fun & Formal! While we've certainly enjoyed seeing the sunshine and some warmer temperatures these last few days, the only down side is super slick roads and sidewalks. When things warm up during the day, snow melts and turns everything into a wet, slushy mess. Then as soon as the sun goes down, the temperatures drop below freezing, and all that water and slush re-freezes and turns our sidewalks into a skating rink! Now, I like skating rinks as much as the next gal, but I don't wear my ice skates on my morning walk. I wear boots. My boots have fairly decent traction, but on days like this it's just not enough. Multiple times this morning, I slipped just walking on the sidewalk. Luckily I caught myself every time and managed not to fall. But I could have avoided those scary moments by simply listening to my own advice and putting on a pair of Yaktrax. Lightweight and portable, Yaktrax slip on over your normal shoes to provide some traction, much like chains work on car tires. In fact, some of the newer models, called Ice Trekkers, are actually chains, and they work great! For the most rugged use, try some Yaktrax Extreme or Diamond Grip Ice Trekkers. I used the Diamond Grip on a hike the other day, and totally walked right down a very steep, snowy, slick trail without sliding once. If you're walking around Frisco and needing some extra traction, come see us! We have variety of styles and sizes to choose from. If possible, try to bring in the shoes or boots you want to wear your Yaktrax with, and we can help you figure out the best size. Our pocket knives are made in the USA and come in a variety of styles and sizes. Your wedding is just around the corner, and it's time to finish up the details. One important item on the list is getting gifts for the groomsmen. Don't know where to even begin with choosing a token of your thanks for standing by you on this happy day? Here is a helpful list of groomsmen gift ideas, so you can check at least one item off of your to-do list! Many men like to carry pocket knives because you never know when one will be needed. Giving each groomsman a knife gives them a gift that won't sit on a shelf unused. Selecting a knife with a meaningful symbol, or engraving names on the knives, adds that special personal touch that lets them know that you are thankful for their friendship. If your groomsmen are outdoor or hunting enthusiasts, consider some camouflage presents. Camo flasks, toiletry bags, or baseball caps are sure to bring words of appreciation from the male side of your wedding party. Cufflinks are a common go-to groomsman gift, but you can also add a twist to the usual style. Cufflinks come in an unending assortment of designs from superheroes to bullets. This will give you a way to incorporate a little bit of your personality into the wedding decor. Take each groomsman's favorite sports team into account and assemble a box of team apparel and gifts. You can include a t-shirt, hat, mug, pint glass and a car decal, for example. They will be totally prepared for the next game day! A handy set of grilling tools is sure to be a hit. Look for sets with a case and a good variety of useful gadgets to use at their next barbecue. Go the extra mile and personalize the outside of the case. Another idea is good quality crystal wine or scotch glass, perhaps paired with a bottle of wine or scotch! You know best what your friends and relatives would appreciate. The main thing to remember is that groomsmen's gifts don't have to be the carbon-copy, average gifts given at most weddings. Make yours a gift to remember by choosing presents they will never forget. We love Steamboat Stickers and Dust City Wood Stickers! Both made right here in Colorado. In your lifetime, you will probably accumulate a sizable collection of souvenirs. Some will be from your own travels, while others are gifts from friends and relatives who thought of you on their own vacation. These fun gifts are more than just trinkets. They can serve as daily reminders that transport you to a beautiful place. In fact, touching and/or viewing an object associated with a memory allows people to better retain those memories. Although photos are a great way to share and recall our travel memories, we are no longer as likely as we once were to print out our pictures and put them in albums or frames. A keychain, mug or hat provides a physical, tactile object that serves as a reminder of your great vacation. These souvenirs are also something that can be passed on to the next generation. Sometimes items displayed in your home can spark a conversation and lead to stories of special times and adventures. Giving souvenirs is also a great opportunity to share your experience with others and show them you care. The lucky people who receive these gifts may not have been on the trip with you, but they will realize that you thought of them while you were traveling. If you can find locally made souvenirs, this can make the items even more special. 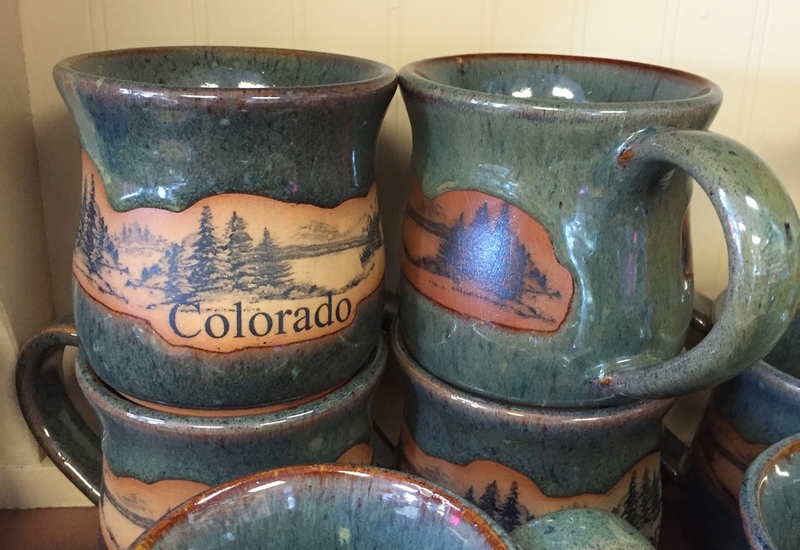 We carry several items that are made here in Colorado, including stickers, shirts, jewelry, ornaments and pottery. Whether you are traveling with family, friends or going solo, take the time to pick up that magnet, patch, sticker or beer stein. Souvenirs are great investments for future smiles. At our gift shop, ornaments are very popular not just around the holidays, but throughout the entire year. Meaningful, small and easily transportable, they always make a terrific gift for family and friends. We carry many different types of ornaments, and each one has something unique to offer. Willow Tree angel ornaments have definitely stood the test of time. Year after year, customers come in looking specifically for the latest design. All of the Willow Tree ornaments are designed by artist Susan Lordi, who sculpts the original of each figure in her Kansas City art studio. Her hand, and her unique perspective, is evident in each sculpture. Each ornament has a theme--friendship, thanks, courage, hope--and comes in a box, all ready to be gifted to that special someone. 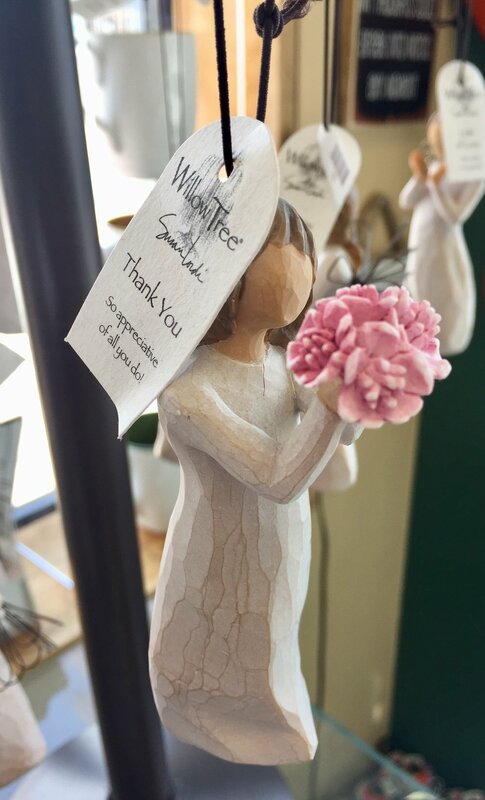 If you're looking for Willow Tree angels in Summit County, Colorado, we've got them here, year-round, at Frisco Fun & Formal. A popular gift choice, Always Azul pottery is made here in Colorado. Vacation should be relaxing. It helps to know your house sitter is watching over things while you’re away. It's comforting to have someone there, checking to make sure that nothing leaks, explodes, falls down or disappears in your absence. It stands to reason that you want to find the perfect way to say thanks. Obviously, cash goes a long way, but in addition (or if you trade house sitting with a neighbor and don't pay each other) you can personalize your gratitude with these gift ideas for your house sitter. If your house sitter is staying at your home, leaving the refrigerator well stocked and perhaps adding some quick, heat-and-eat meals to the freezer is a good start. Adding some chocolate or other treat, and maybe a gift card for food delivery, will help make your sitter feel appreciated. Be sure to leave a list of emergency numbers and some cash to use for minor crises that might come up. You can leave a fruit or food basket for the house sitter to enjoy while you’re gone. You could include a favorite beverage, some snacks like granola bars, crackers or chips, and toss in some candy. Or fix a beauty basket with bubble bath, body wash, a loofah and some aromatherapy candles. If you don’t want to go the traditional basket route, you could also have the florist deliver a gift basket that includes fresh flowers to enjoy during the stay. Gift cards are always appreciated. Give your house sitter a card for a dinner-and-movie night out, a favorite store, or maybe a spa treatment. Other gift card ideas include a local grocery store, a specialty shop, bookstore or movie rentals. 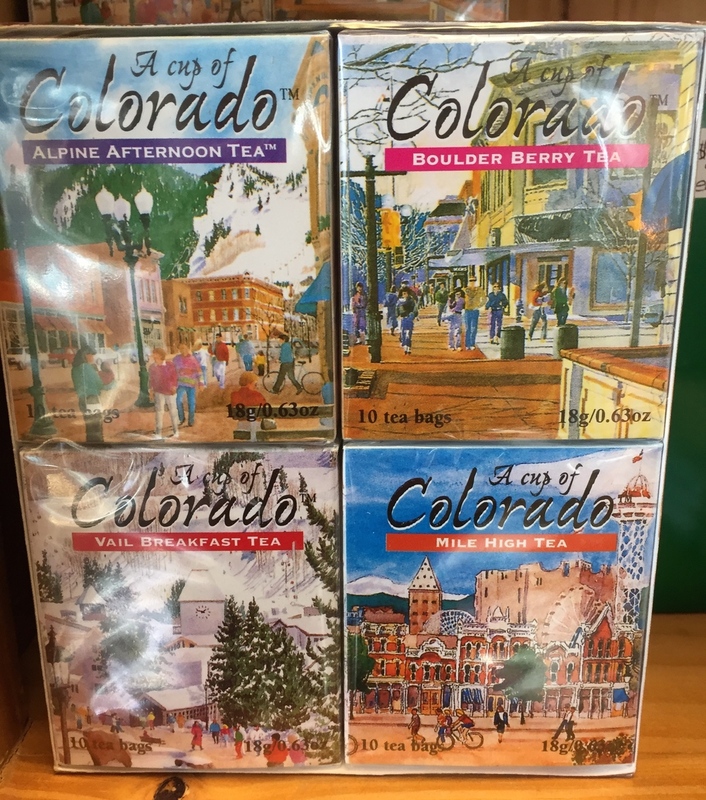 If your house sitter is a tea drinker, a mug and some tea from Colorado could make the perfect gift! The best thank-you just might be what you bring home with you. Giving your house sitter a regional specialty or souvenir from the place you visited lets your sitter know that you thought of him or her when you picked it out. Nearly every community has something that is unique to the area; bring that special item back to your sitter to show how much you appreciate the peace of mind they provided while you were relaxing! If you're looking for the perfect gift to take back to your house sitter from your Colorado vacation, come check out our selection at Frisco Fun & Formal! This is a guest post by fashion and jewelry writer Ruhi Jiwani. This article from The Art of Manliness expounds upon the power of jewelry, saying, “for better or worse, it sends signals about who we are, what commitments we have made, and our status in society.” When you’re a man, jewelry says even more about you because you’re making an obvious choice to wear it. Not every man in present-day society chooses to make jewelry a part of his wardrobe. So when you make that choice to wear jewelry, you’re saying something about who you are. Based on the three types of jewelry styles men usually adopt, you can decide what types of gifts to give them. Some men won’t wear more than one piece of jewelry, usually a wristwatch or a wedding ring. In general, the impression this creates is of someone rather conservative. You see a man who’s dressed in a formal suit without any jewelry and you might think of someone rather strict and rigid. If you're giving a gift to someone with a minimalist jewelry style, keep in mind that this person isn't going to use jewelry to express who he is. He may actually be a very liberal, easy-going person but he doesn't wear jewelry because he doesn't know where to begin. The impression he ends up making is one of severity. Give him a gift of jewelry so that his wardrobe expresses his personality; he'll probably appreciate the thought. There are people who don’t wear too much jewelry but when they fall in love with a piece, they’ll wear it constantly and make it a part of themselves. This can be an endearing trait. Don’t you have any friends who wear the same necklace day in and day out? It doesn’t matter whether they’re wearing shorts and a t-shirt or a blazer with jeans. That necklace is always there. You come to associate it with them. If this is the way in which your male friend wears jewelry, you might want to give him something different and unique-looking. Encourage him to take a few chances because there are a lot of great pieces out there that he might like if he just gave them a chance. These rings and other jewelry by Navajo artist Justin Morris are very popular with men. We all know someone who wears a lot of necklaces, rings, earrings, bracelets and watches. Sometimes, you can just indulge people like this and laugh off their tendency to wear a lot of jewelry. At other times, however, it might seem inappropriate. For example, you probably shouldn't wear a lot of jewelry if you’re going to a formal event. So if you’re giving a gift to the kind of guy who likes to pile on the jewelry, get him something with a more sober look so he can wear it to work and formal events. He probably already has a lot of chunky jewelry that he wears when he hangs out with his buddies. At Frisco Fun & Formal, we certainly have more women than men come into the shop looking for jewelry, but we do carry some great items for guys, including Western, Native American and some simple sterling silver pieces. If you have the privilege of attending a beautiful mountain wedding in Colorado, you're in for some breathtaking views, and you'll certainly find plenty of recreational activities to keep you busy before and after the wedding. One thing you won't want to spend too much time doing is shopping for the perfect wedding gift. In an effort to give you more time to enjoy the crisp mountain air, and less time staring at store shelves, here are a few of our favorite ideas for Colorado wedding gifts. Columbine Flower Seeds - The Columbine is the state flower of Colorado. It is a beautiful, hearty flower that comes in many shades, is easy to grow and blooms annually. The newlyweds can plant the Columbines at their new home, and every year when they bloom the happy couple will remember their Colorado wedding. This affordable present also can be a thoughtful personal addition to a gift from their registry. Colorado Microbrew - Colorado is known for its craft brewing. Whether you grace the couple with a beer from New Belgium Brewery in Northern Colorado or a local favorite from Dillon Dam Brewery or Breckenridge Brewery, you simply can't go wrong. Add a few Colorado-themed pint glasses and the bride and groom can enjoy your gift long after the beer has been consumed. Ornaments - When the newlyweds enjoy their first Christmas as a married couple, they will love having a memento from their wedding day. You can choose a Colorado ornament to remind them of the day they shared their love publicly in the mountains. If this is a destination wedding a souvenir is a thoughtful gift, because the couple will probably be too busy to pick something out for themselves. Who's taking care of your baby while you're out of town? Make sure to remember them when souvenir shopping! The day has finally come. You've planned for the perfect vacation, made all of the reservations, packed your bags, let everyone know you are leaving, and now it is time to actually go on your trip! Luckily you found someone you can trust to take care of your precious pet while you are away. Here are some helpful tips and gift ideas for your pet sitter to let them know how much you appreciate their help while you are on vacation. If possible, take the time to find something that is unique to the area where you traveled so that the pet sitter can share a bit of your vacation too. One example is a Christmas ornament from your destination. This will remind the pet sitter of your friendship every year when they hang the ornament on their tree. If you know what size your pet sitter wears, you could find a t-shirt from the area you visited. The selection is nearly endless in most places, so you should be able to find the perfect shirt for your pet sitter. Local jewelry is also a great idea. A piece of jewelry that can't be purchased locally makes it more unique and more special. The jewelry might come with a good story about where the pieces came from or how it was made. Chances are good that a pet sitter likes animals, so another idea is an animal-themed gift of some sort. Mugs, socks, note pads, t-shirts, jewelry--all of these and more can be decorated with animals of all kinds. The gift ideas are endless, so think about your pet sitter's interests and try to find something that they will appreciate. And finally, be sure to thank your sitter for taking care of your precious pet! It's funny how time flies! Not so long ago, you were watching your little one head off to school for the very first time. Now you're headed to their high school graduation. Many parents and other relatives like to give gifts to commemorate this major life event. Sometimes it can be a little challenging to select the perfect gift for your graduate. You want something that shows them how proud you are of their big accomplishment. At the same time, hopefully it's also something they will appreciate and enjoy. Jewelry is a favorite graduation gift choice, especially for girls. If you know her taste, you can find the perfect piece -- and she'll think of you whenever she wears it. You might also consider items that can help your graduate on through their next phase of life, such as something for their dorm room or apartment, or an item they can use for their new job. A graduation gift doesn't have to be large or expensive, and you might just want to send the new grad on their way with a little cash in their pocket. At the same time, you can also include a little something to commemorate the event, acknowledge how far they have come, and show your confidence in where they are headed. Photo frames and pocket knives are a couple of our most popular gifts for new grads. We also carry greeting cards. You could even put together a Colorado-themed gift basket to remind them of home, especially if they are moving out of state. We have a wide selection of keychains, magnets, stickers, patches, mugs and Colorado-made food items that would make a great care package. For more gift ideas for your graduate, stop by the shop and we'll do our best to help you find the perfect thing to acknowledge this special occasion.